Are there vitamins in honey? Er, NO?! There are no vitamins in honey?? Well, almost. “Honey” is a generic word. It represents a class, including as many types of honey as many flowers exist. Or trees, because honey can be made from drops of dew, found on the trees. We cannot possibly compare a chamomile with a fir tree, or a cactus. How can we compare chamomile honey with fir tree honey? We cannot. But we CAN talk about an average, we can compare the tests made in time, on different kinds of honey and draw a conclusion. Starting from this point, we can say that honey has a very tiny amount of vitamins. Despite all blogs that praise honey as a good source of vitamins. If a person is forced to eat only honey all the time, he won’t cover his daily necessary vitamins. But nobody is in this position. And taken in a regular diet, the vitamins in honey are important not through their quantity, but through the way they complete each other, and enhance their effects. Vitamins: the word “vita” comes from Latin and means “life”. Without vitamins, the proteins, carbs and fats could not be completely decomposed to make enough energy. Our organism is able to synthesize some vitamins, but not all of them, and that’s why we do need to take vitamins through our food. Or supplements, when the food cannot cover the daily necessary. The good news is that we do not need large quantities of vitamins. They are enough in smaller doses, with the exception of Vit C, which should be more than minimum 20 mg daily. Vitamins are hydrosoluble and liposoluble. The liposoluble ones can be stored in our fatty tissue, and there is no need to ingest them daily. But the hydrosoluble ones cannot be stored, and we should ingest them daily. Honey contains only hydrosoluble vitamins. Vit C and Vit B. And when we say Vit B we understand all vitamins B, because in all natural products, those vitamins always come together, never alone. • In 1942, M. H. HAYDAK and all, from Divisions of Entomology and Economy Zoology and Agricultural Biochemistry, University Farm, St. Paul, Minnesota, conducted a statistical study of the vitamin content of twenty-nine samples of Minnesota honeys, and the vitamin content of thirty-one individual samples of honey from various regions of territorial United States as well as seven samples of foreign honey. See the picture for their results. 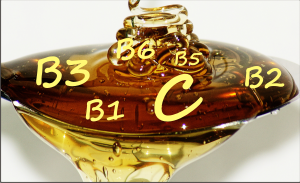 Only Vit C (ascorbic acid) has the results in mg, the others are expressed in µg per 100 g honey. • In 2005, in his book “Honey, food and medicine”, Renate Frank says that honey contains as many Vitamins B as any other fruit or vegetable. Yet, if we were to feed ourselves exclusively on fruits, we won’t be able to cover the necessary daily doze of vitamins B. Just like when eating exclusively honey. But nobody says eating fruit is useless. 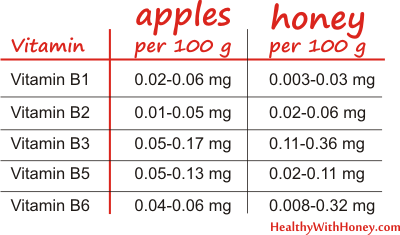 If we compare the content of Vit B in 100 mg apples and 100 mg honey, we get similar values. Data regarding apples’ content have been collecting from “Der Apfel – ein bewährtes Hausmittel neu entdeckt”, 1998, a book written by H. Buchter-Weisbrodt and U. Schöber. In the 70s, Crane, Schweitz, Bienenvater, described in “Die große GU Nährwert Tabelle” the B Vit content of honey. Vit B1: 0.0 mg, Vit B2 0.0 mg, Vit B3: 0.1 mg, Vit B5 0.1 mg Vit B6: 0.0 mg. And this is close to nothing. This explains the title of this article, right? It is true that all we can find there is a generic term, honey, which can be exactly the honey we find on a supermarket shelf. Meaning super-processed. And we definitely don’t refer to that type of honey when we recommended for our health. Perhaps this would explain why in 1942 honey had vitamins, and in 2015 honey doesn’t have vitamins. • In 1938, Griebel reported 1.6-2.8 nig. ascorbic acid (Vit C) per gram of mint honey and 0.07-0.2 mg per gram of some other samples. • In 1938, Kask demonstrated the presence of ascorbic acid in Esthonian honeys, the amount being from 0 to 20 (average 4.8) mg per 10 gm. He also reported that the ascorbic acid content of honey decreases with age, but that honey is a relatively stable medium for vitamin C.
• In 1938, Werder and Antener determined the ascorbic acid content of nineteen samples of honey. The variation was from 1.1 to 14.6 mg per 10 gm. • In 1939, Becker and Kardos, employing microchemical methods, found from 31 to 89 mg of ascorbic acid per 10 gm of Castanea sativa honeys. On the basis of their animal tests, they concluded that the reducing component of honey is not vitamin C.
• Griebel and Hes reported 31.2 mg and 102.6 mg of vitamin C per 10 g Buckwheat honeys contained from 7.36 to 18.6 mg ascorbic acid per 10 g.
• In 1940, the same authors investigated the ascorbic acid content of nectar of the studied plants. 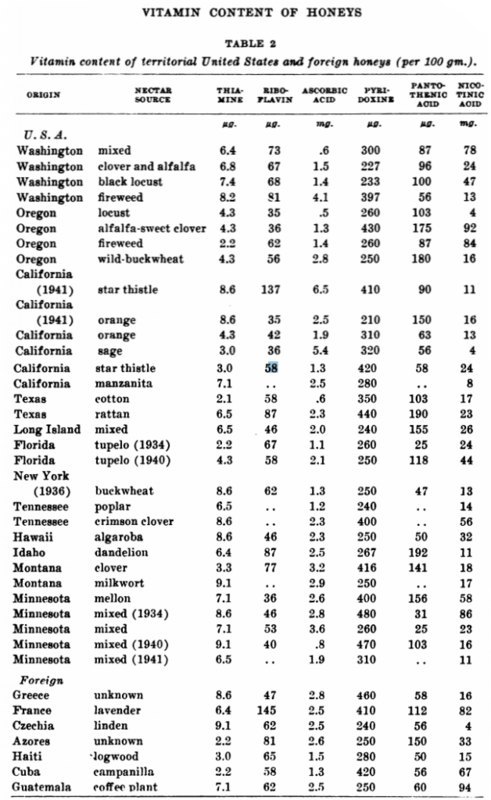 A comparison of these data with those obtained on the honeys indicates that there is a considerable loss of vitamin C when the bees convert nectar into honey. • In 1942, M. H. HAYDAK and all, said in their study “VITAMIN CONTENT OF HONEYS”, that the content of Vit C in honey rages from 0.5 to 6.5 mg / 100 g honey, as seen in the picture above. Considering only the samples studies. 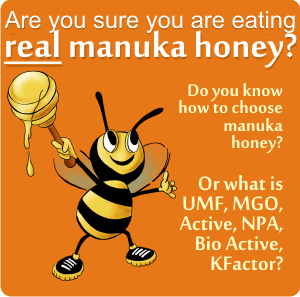 No manuka, no tualang, no sidr, no honeydew or other, from what is today considered “medical honey”, were studied. 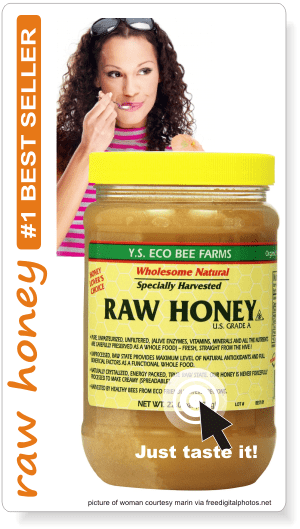 • In the 2000s, other researchers demonstrated that honey contains 0.1-2.5 mg/ kg honey. • In 2013, Chua L and all, in the study “Antioxidant Activity of Three Honey Samples in relation with Their Biochemical Components” said that there are 52-62 mg of Vit C per Malaysian honey kg. Malaysian honey contains a larger amount of Vit B3: 170-355 mg / kg honey (compared to regular honey which has only 0.10-2.7 mg/kg.). 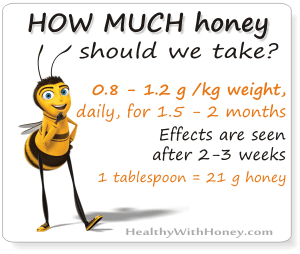 • In 2015, according to nutritiondata.self.com honey has strictly 0.5 mg Vit C per 100 g honey. How is this compared to the data found a few decades ago? The reduced vitamin content of the processed honey is no doubt due to the removal of the pollen from all jars with honey. Heat also destroys vitamins, and diatomaceous earth used to clarify and then filter the honey will also absorb the vitamins. Among others. Which brings us back to: EAT ONLY RAW HONEY! Choline. Considered vitamin for a log time, it is in fact a protein, but with an effect similar to that of B Complex. The major difference is that choline can be synthesized by our organism. This happens only when methionine consumption exceeds the necessary, and it is not used in protein synthesis. Honey contains both of them, and our methionine will not be used to synthesize choline, and it will be available for other processes of the body. 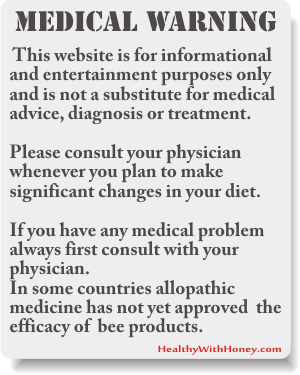 (according to Renate Frank in “Honey, food and medicine). Choline is essential for cardiovascular and brain function. It regulates cholesterol levels, and prevents fat deposits in blood vessels. It is essential for the cellular membrane composition and repair. In form of acetylcholine is used for transmission of nerve impulses (neurotransmitter), being responsible for a good function of memory and focus capacity. With age, we lose the quantity of choline that reaches the brain, and that is why we should consume more in our diet. Honey is a good source of it. It contains 0.3 – 25 mg choline / kg honey and 0.06 – 5 mg acetylcholine / kg honey. Vit B1 (thiamine), Vit B2 (riboflavin), Vit B3 (nicotinic acid, or niacin), Vit B5 (pantothenic acid), Vit B6 (pyridoxine), and Vit C (ascorbic acid). Other researchers also found traces of Vit K and Vit B9 in specific types of honey. • The amount of vitamins is extremely variable, depending on the source of honey and the number of pollen grains. It also depends a lot on the type of flower/tree, soil, humidity, weather and harvesting conditions. The most pronounced variation found was in the Vit B3 (nicotinic acid) and Vit C (ascorbic acid) content. Processing the product, actually clarifying it with diatomaceous earth diminishes the vitamin content of honey and therefore should be avoided. • It is not only about the quantities of the vitamins, but about all its compounds. For example, there is no need of huge quantities of Vit C, because flavonoids from honey prevents the Vit C disintegration, and gives it an effect which is several times stronger. The synergy between all elements of honey makes it a unique, incredibly healthy product. The fact that their quantities are so small, reminds me of homeopathic remedies. The active substance is so hugely diluted that we can say it doesn’t exist anymore. Yet, the information is there, and they do their job very well. So, if not much vitamins, what do we find in honey? – antioxidants: ORAC and polyphenols. Read about them in the next article. 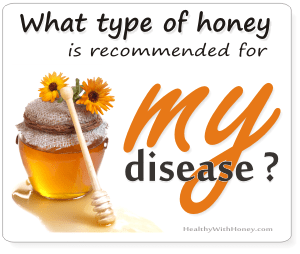 Sidr honey benefits for health What is processed honey?